“How I Stopped Resisting Monotony and Learned to Love George Stone’s Stick Control"
One of the questions I get asked after shows is “how long have you playing?” Just recently I used to pause, and then ask the questioner, “What’s the date?” The person would think for a minute and just as he or she would answer, the joke would become apparent. The proverbial light bulb would go off over his or her head and they would realize oh, you haven’t been playing that long. One of the other facts about Short Punks in Love is that it wasn’t really formed until I could hold a beat for 40 minutes. Until then, we were just another married couple with a hobby. In a nutshell, I felt old. And old, not in a good way. Not in the “oh, aren’t I wise?” way but in the “my brain has begun to ossify” way. I was feeling myself not remember as much as I used to. I was feeling my body not move the way I was used to. And not only had I been dating the same guy for four years, I had been married him to the whole time. Whoa. So, learning to play the drums felt like teaching a really old dog a new trick. My nemesis in that journey from not knowing how to play the drums at all to playing a 45-minute set was George Stone. 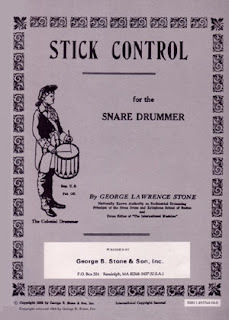 George Stone is the author of a book many beginning drummers know: Stick Control for the Snare Drummer. The first book the teacher gives you right after you buy the practice pad and your first pair of 5A drumsticks. A grey-covered book with a line drawing picture of (and I kid you not) a Colonial Drummer and “Colonial” in the sense of “America, the former colony of England.” It was first published in 1935; it’s an old book. I should have been comforted by this fact, but I wasn’t and flipping through the pages didn’t make me feel better. Page followed page after page of black dots. Black dots in every configuration. Dots spaced far apart. Well, that doesn’t look too hard. Black dots squeezed together so tight I wondered if I was getting double vision. Okay, that looks hard. On top of that, in the introduction George Stone writes in CAPITALS: “The author recommends that each rhythm be practiced 20 TIMES WITHOUT STOPPING.” Twenty times without stopping? Could I play it even once without stopping? I walked away from the music store in the crisp January cold, wondering if I could pull this off. Could I really learn to the play the drums? My first sit-down with George Stone happened in the converted back porch of our two and half-bedroom apartment. I was in the half bedroom part. George Stone’s Stick Control was propped on the metal music stand I still had from my childhood as a Suzuki violin student. The practice pad was on an office chair and two brand new drum sticks sat lightly between my fingers. My right hand let the stick fall. My left hand let go of the other stick. Then right again. Then left. Right. Left. Right. Left. Well, that’s not so bad…wait what’s this?? My left stick clicked against my right stick. My fingers seemed to catch each other in mid-air. Two minutes into my journey into drummer-hood and I was stumped by a simple right-left-right-right. I would learn later that this was the infamous paradiddle. That’s as far as I got that day. I put it all away. I was too old. I walked out of the converted back porch into the comfort of the apartment. The next day I went back. I propped George Stone up on the metal music stand and ignored all the notes in the book except: RIGHT. LEFT. RIGHT. RIGHT. For 15 minutes that was all I played. For the first 5 minutes I couldn’t do it. By the end, of 15 minutes I could play it for 2 minutes. When fifteen minutes was over, I put George Stone and the sticks away and went back into the apartment. The next day I went back to the porch and played it again. For 15 minutes. I knew George wanted 20 TIMES WITHOUT STOPPING but all he was going to get from me was a couple times without stopping. The first 2 months of learning to use George Stone’s Stick Control time was just a matter of 15 minutes. Not an hour. Not 30 minutes. Not even 20. Just 15. That was all I could handle at the time, because after 15 minutes a thought would grab hold of me and each stick falling seemed to have a voice that said: too old. Right. Too. Left. Old. Too old, too old, too old. After 15 minutes I just seemed to hear too old over and over again until I had to stop and walk away. Then, miraculously, one day I was playing halfway down the first page, playing the same pattern I had been playing for the last week, when I thought hm, I wonder what the next pattern sounds like, and before I knew it I had jumped down and played it. Then I played it again. And then I skipped down to the next pattern. Before I knew it I had played the whole page. Sticking not just right-left-right-left, but right-right-left-left. Then left-right-right-left, then left-left-left-left and before I knew it, George Stone and I were pals. I skipped forward to middle of the book. Wow, look at this! I can play this! And that! And what’s that? That looks cool! I want to play that! I wasn’t too old anymore. And that voice in the drum sticks that seemed to say, “too old” was gone, replaced with “why not?” Why not learn the drums! Why not pick up sticks! Why not?! Why not?! After a month on the practice pad, I graduated to my first drum kit bought on Craig’s List for $350, a forest green Tama Rhythm-mate. Then a month after that, armed with the basic rock beat, I did my first show in public, one song, recorded in a studio for Chic-a-go-go. It would be another 8 months before Brian thought we were sounding like a real band, instead of singer-songwriter with a drummer, but that’s another story. For right now, all you need to know is this: anything you really want to learn to do, you can learn in fifteen minutes. Well… that’s what I keep telling myself and as long as it works I’m sticking to it. if he were still around, i think george plimpton would be proud of your accomplishment, not for the flopping about that sometimes ensue but, rather, for having the temerity to give a new endeavour an honest college try while maintaining a good sense of humour throughout. by the by, with each subsequent recording (and the one live show witnessed a mere month ago) i think your tenacity is making you a better anchor of the rhythm section. i hope to someday bring my bass over to complement THE most important section of any band, but i suspect i would be the other half of plimpton’s legacy (i.e. the fumble-fingered metranome-wanna-be who is the bane of every [chick] drummer’s sanity, aside from the boo-boo face, of course). but i shall work and strive because i like to and you provide a bit more inspiration to me. Wow. I found this post (and blog) by accident am I’m glad I did. I’m a 45-year woman who is returning to drumming after an 11-year hiatus that was caused by a bicycling accident. I am blessed with an understanding partner (who doesn’t mind my practicing! ), a copy of the old NARD drum solos book I’d hung onto since high school, and… NO copy of the Stone. Dammit! I thought I’d saved it. Now I have to go BUY a copy. Ugh. But I am enjoying the rediscovery, and your post is inspiring. THANK YOU. I think we need more over female drummers over 30 out there — so congratulations!! I think re-learning must be harder than learning for the first time, because you have to re-capture techniques you used to know. Good luck with the drumming! And say ‘hi’ to George Stone — although, I see him everyday myself. Thanks for stopping by the blog and posting!